I am thrilled to be here with you all on this very special graduation day. I feel truly honored to be a Dawson dad and I am enormously grateful to this school for the world-class education it has given to my sons Christian and Thomas in past years, and now to my daughter Gabi, graduating today in this amazing class of 2016. I have a confession to make up front: It is a little scary to give a talk to your daughter and her friends. Last week she said: “No pressure, Dad. But this better be good. In fact, this is the most important talk you’ll ever give in your whole life.” No pressure at all. 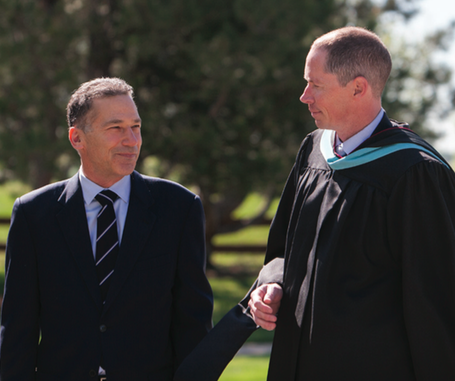 I feel fortunate to be here because – another confession –I didn’t have a chance to participate in my own high school graduation owing to a youthful escapade three weeks before the term’s end when I left campus without permission with my girlfriend. It was foolish, of course, but looking back at it now, I can see something else behind it: the stirring of an impulse to find my own path in life. And in following that path, I experienced three ahas, three discoveries that were life-changing for me, which I’d like to share with you today. You see, when I left high school, I had no idea what I wanted to do. All I knew is that I wanted to love whatever I did — and to do whatever I loved. I was curious about the world and more than a little concerned about its future, like many of you. I didn’t know what to study so I began to study anthropology – the study of world cultures, the study of humanity – the story of us all. From an anthropological point of view, what’s unique about this particular moment in our human story is that, for the very first time, thanks to the Communications Revolution, all the tribes on earth – over 16,000 different language groups – are in touch with one another. Facebook alone has a billion and a half users. Whatsapp already has a billion and it’s only six years old. It is like a big family reunion. But like many family reunions, it is not all peace and light. In fact, there is lots of conflict – resentment, hurt feelings, injustice, and yes, violence and war. The question that made me really curious was: With all of our differences, how can we possibly get along? How can we deal constructively with our conflicts and solve our problems through cooperation? Is it possible for us to learn to live together peacefully in our families, our schools, our nations, and our world? This has been my guiding question ever since. It gets me up every morning. And it has led me to places and people I would never have imagined when I started off on this quest – from mediating small claims like a dispute over rent, to the bottom of a Kentucky coal mine trying to settle a rash of labor strikes and bomb threats, to spending time with the San Bushmen of the Kalahari and the clan warriors of New Guinea, to Moscow during the Cold War working on how to prevent an accidental nuclear war, to Northern Ireland during the troubles, Yugoslavia during the civil war, South Africa during apartheid – wherever conflict was brewing until just two weeks ago when I was in Myanmar, working with the new democratic leader, Aung San Suu Kyi, a brilliant and courageous woman, jailed for 20 years, who is now seeking to end a 65-year old war with at least 17 different ethnic groups. It has been an extraordinary privilege to learn from all these different situations. But as much as I might learn, I don’t think I’ll ever quite get to the bottom of my guiding question. And that’s what makes it endlessly fascinating. This was my first aha. Because the importance of a good question wasn’t obvious to me when I was leaving high school. When I was at school, the key to success was giving the right answer. But in life, I learned, the key to success is asking the right question. The question that will tap into your deepest curiosity. The question whose pursuit will help you develop your talents and offer them to the larger community. The question that will make you want to get up in the morning and embark on a new adventure. Identifying that guiding question proved more important for me than selecting any particular major in college, or even than choosing any particular career path. You may change majors – and you are very likely to change jobs and even careers in your life – but a guiding question can remain with you for your whole life, inspiring you every day. And that power of a guiding question is what I wish for each of you. But in life, I learned that as important as competition can be, even more important is cooperation. Whatever guiding question you pick, whatever problem you tackle, you are going to have to do it with others. The key to success in this world is to be able to cooperate. The paradox is that the best way to compete in the 21st century is to learn how to cooperate. 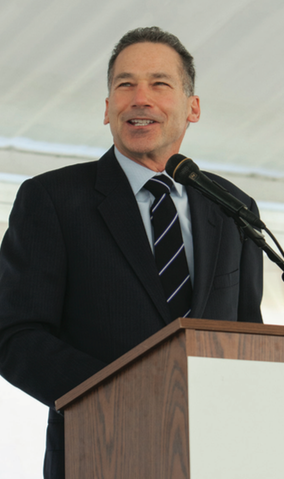 The individuals and organizations that know how to cooperate best have the competitive edge. So if I have one suggestion to offer to you today as you go off into the world, it is that you might learn how to negotiate in a cooperative fashion, so that you can succeed in whatever field of endeavor you choose to pursue as your passion. Think about it for a moment. If I define negotiation as back and forth communication, trying to reach agreement on some issue, however small, think about who you negotiate with in the course of your day: your family, your friends, your teachers, your co-workers, your customers. We negotiate with just about everyone from morning to night. Imagine if we could negotiate better with a higher chance of mutual satisfaction. The key principle in negotiation is very simple: It is to look behind people’s positions for their interests. Positions are the things people say they want. Interests are what people really want — the underlying motivations behind their positions — the needs, desires, fears, concerns, and aspirations. Let me give you a simple example that comes from the mother of modern management over a century ago, Mary Parker Follett. She once observed two students quarreling in a Harvard library. One wanted the window open, and the other wanted it closed. The first went and opened the window. The second got out and slammed the window shut. They got into a big argument and bothered everyone in the library. Finally the librarian came over and she asked the first student, “Why do you want the window open?” “Because I want some fresh air.” She asked the second student: “Why do you want the window closed?” “Because the draft is blowing my papers around.” So she asked them: “How do we get you some fresh air without giving you a draft?” They thought about it for a bit and then one said: “I have an idea.” And he went into the next room and opened a window there, thus providing fresh air for one without a draft for the other. Think about what happened here. They started off with two positions: open window and closed window. By asking the magic question why, the librarian helped them get to their underlying interests: fresh air and no draft. By identifying their interests, they were then able to look for a creative solution that met both sides’ interests: an open window in the next room. It wasn’t a split-the-difference compromise, a half- open window, which wouldn’t have satisfied either student as it would have been too much draft and not enough fresh air. It was a genuine win-win. That is what successful negotiators do: They listen carefully, they probe behind positions for underlying interests, and then they invent options that meet both sides’ interests. Everyone wins together. If you can learn to do this, you will be in very good stead as you go through college, get a job, negotiate a raise, have relationships, form a family perhaps, help the world. That’s what the world needs now: a little less talking and a little more listening, a little less rigidity and a little more creativity, a little less fighting and a little more negotiating. Imagine a world in which we truly know how to get to yes. What problem — large or small — could we not solve? We’ve had a computation revolution, that has made possible a communication revolution. Now we need a third C – a cooperation revolution. That is the great challenge and the great opportunity for your generation. So, as you pursue your dreams, I wish for you the power of cooperation. And this brings me to my third and last aha. When I was in my late twenties, I had the good fortune to coauthor a book about negotiation with my colleague and mentor Roger Fisher. We titled it Getting to Yes. We had no idea at the time it would reach as large an audience as it has – at last count, over thirteen million copies in English, with another thirty-five foreign editions. 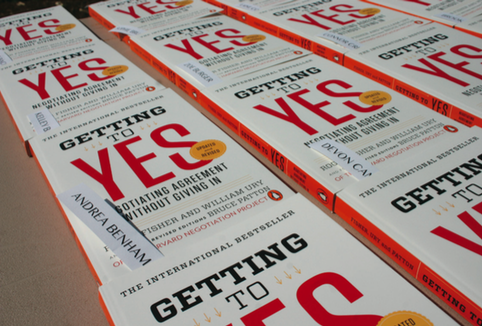 In the years after writing that book, the most frequent question I received was, what if the other person doesn’t want to get to yes? So I decided to focus on dealing with difficult situations and difficult people, and I wrote a follow-up book called Getting Past No. But over time it gradually occurred to me that the most difficult person we ever have to deal with in life isn’t who we imagine it to be. It’s not the person on the other side of the table. It’s the person on this side of the table. It’s the person we look at in the mirror every morning. It’s ourselves. The biggest block to our success in life is ourselves. It lies in our very human, very understandable tendency to react: to act without thinking. As Ambrose Bearce once quipped, “When angry, you will make the best speech you will ever regret.” So what’s the alternative? It is to go to the BALCONY. Imagine you’re negotiating on a stage and part of your mind goes to a mental and emotional balcony, a place of calm, perspective, and self-control where you can stay focused on your interests, keep your eyes on the prize. Let me give you an example from my own experience of a particularly challenging negotiation I had some years ago with the president of Venezuela, Hugo Chavez. I was in Venezuela serving as a third party between the government and the opposition at a time of intense conflict, with many people fearing a civil war. My colleague, Francisco Diez, and I had an appointment with President Chavez at 9:00 pm at the presidential palace. But I was able to catch myself and go to the balcony for a moment. And on the balcony I remembered my guiding question. What was my purpose? It was trying to calm the situation. Would it really advance my purpose to get into an argument with the president of Venezuela? So I just listened, giving him my full attention, trying to understand what was really going on for him. President Chavez was famous for giving eight-hour speeches but, after thirty minutes of me just nodding and listening, I saw his shoulders slowly began to sag and he said to me in a weary tone of voice: “OK Ury, what should I do?” That is the sound of a human mind opening — opening to listen. So I responded: “Mr. President, I think the whole country needs to go to the balcony. It’s almost Christmas, the country needs a break. Last year, because of the conflict, festivities were canceled. Why not propose a truce this year so people can enjoy the time with their families? Then when we come back, maybe everyone will be in a better mood to listen.” “That’s an excellent idea!” he declared. “I’ll propose it in my next speech. In fact,” he said, “why don’t you travel around the country with me over Christmas, see the country for yourself?” Then he caught himself: “But maybe that wouldn’t be so good since you’re supposed to be neutral. But that’s okay, I’ll give you a disguise.” And he laughed. His mood had completely shifted. What I learned is that one of the greatest powers we have is the power not to react but rather to go to the balcony and keep your eyes on the prize. So that’s the third power I wish for you in your life – the power of the balcony. Let me conclude with one of my favorite negotiation stories from the Middle East where I’ve done a lot of work over the years trying to create a long distance walking path that follows the footsteps of Abraham. So then, they had 18 camels. The first son took his half — half of 18 is nine. The second son took his third — a third of 18 is six. The youngest son took his ninth — a ninth of 18 is two. Nine plus six plus two adds up to 17. They had one camel left over. They gave it back to the wise old woman. This story is a little bit like the negotiations we engage in. We start off with 17 camels. Somehow we need to step to the balcony, change our assumptions, and find an 18th camel. And if you think that’s hard sometimes, you’re right, but it’s not impossible. I stand witness to this. Five years ago I happened to be on this very podium and I had to leave immediately afterwards to go to the country of Colombia where I had been asked to meet with the president who was looking for a way to end a terrible civil war that had been going on for 50 years. Most people back then would have given less than a 5% chance to the possibility of success. Since then I’ve been called back 20 times to assist president Santos and his negotiators in going to the balcony, looking for the interests behind everyone’s positions, and finding that 18th camel. Their work hasn’t been easy at all but I am very happy to report to you today that these negotiations, which started off as top secret peace talks in Havana, are finally nearing an agreement. They are on the verge of an historic peace agreement that will not only bring an end to 50 years of civil war but will herald the end of war itself in the Western Hemisphere. For the first time in recorded history, there will be no war in the entire hemisphere. And if we can get to peace in one hemisphere, why not one day in both hemispheres? That is what gives me hope. And that is the feeling I have as I look at your shining faces today in the Dawson class of 2016. You inspire me with hope for our common future. I have a strong sense that you, much more than my generation, are truly citizens of the world. Your generation will be the pioneers of better ways to deal with our differences than war, better ways to negotiate, better ways to cooperate to solve global problems. I believe in you and in your capacities to make this world a better place for everyone. So, as you follow your path, I want to wish you every success in getting to YES! Congratulations to your parents! Congratulations to your teachers! And congratulations to each one of you: The amazing graduates of the Dawson class of 2016! 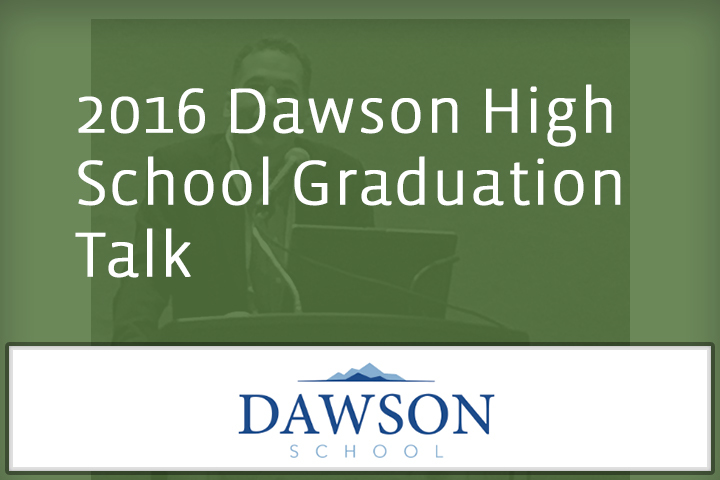 1 Reply to "2016 Dawson High School Graduation Talk"
Key lessons for our future leaders. Let’s hope the schooling, the workplace and society do not indoctrinate them in the “me first” mindset. What insights, for a graduation class.